I've started editing the photos, but it will still be a few weeks before I start posting about our week in Egypt. I couldn't let another day pass without something on the blog. I'm addicted to travel and every trip is a treasured experience. But there are a few trips that have affected me on a deeper level. 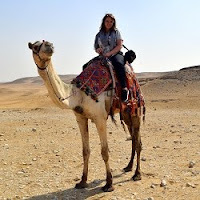 Egypt was absolutely one of those life-changing experiences. I don't really know how to explain it. It went by so fast but I can remember almost every single moment. The place, the people, the history, the dessert, the red sea, the tombs, the pyramids... all of it combined into the most epic week. I love the way it challenged me, both physically and mentally. It caused a big shift in my worldview of the both the ancient and the modern. That's where travel holds the most magic. Where it changes you. Egypt changed me. It's also been a difficult trip to return from. I commute to work and sit at my desk longing to be traveling again and experiencing other parts of the world. Egypt has taken my wanderlust to all new levels. Here are a few of my instagram photos from that week to give you a taste. I couldn't resist adding a little music, so click on the mute button bottom right if you're at work. What place has caused a shift in your worldview? I totally know that feeling you're talking about... India was like that for me. Certain places just touch us so deeply, make us want to learn more and see everything. I can't wait to get to Egypt at some point and can't wait to see more about your trip! I can't wait to read more about your time in Egypt! We're going to Sharm at the end of April. Can't wait now! Egypt is a thrilling destination. Love your shots! Oh Wow Egypt, My dream place, I wish i will visit this place as soon as possible. Ahhh I'm so excited to read more about Egypt!! !